Last week on RAW, Lana got cake in the face which led to a Summer Slam US Title match for Roman Reigns, and Finn Balor gave Rollins a lesson on Irish myths and legends. Earlier today, Seth Rollins called out the “Demon King.” Of course no one showed up, so Rollins decides he will look for the Demon King in the arena. Rusev and Lana (and John Cone) are already in the ring, and they are pissed. 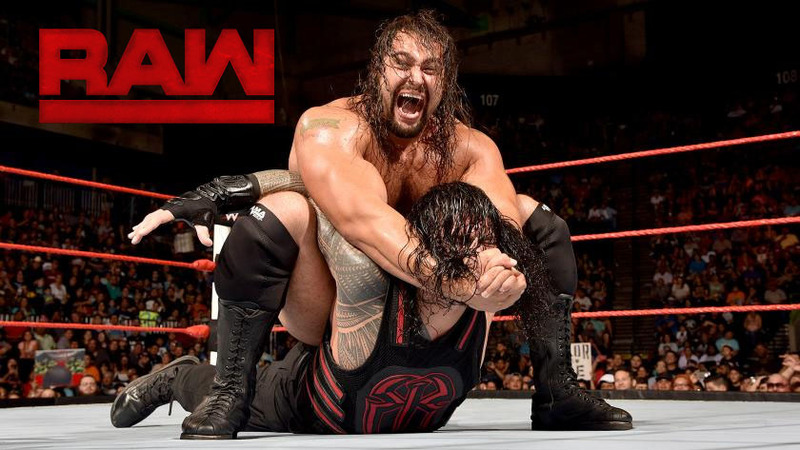 Rusev says there will be no RAW until Reigns comes out and apologizes for last week. Instead of Reigns, Mick Foley heads to the ring. Rusev demands respect. Right now. He won’t deal with Foley, so Stephanie McMahon comes out and heads to the ring. Stephanie reprimands Rusev for not showing respect to Foley. Rusev then suggests that he might call Shane McMahon and Daniel Bryan since they respect talent. Roman Reigns then comes out and makes some jokes. He’s ready to fight, but Steph doesn’t want to give away the Summer Slam match. Foley then steps in and makes a match between Rusev and Reigns anyway, but it’s for Lana’s honor, not the US Title. Byron Saxton asks Sheamus about Cesaro. Sheamus says he’s already proven that he’s better than Cesaro, so he’s moving on to Sami Zayn. Pretty good match. It wasn’t super competitive, but it was entertaining. At the end of the day it was mostly just a way to further the Cesaro/Sheamus feud though. Tom Phillips welcomes Chris Jericho and Kevin Owens. Owens says that he and Jericho are already closer as a team than Enzo and Cass. They also know how to spell. Sheamus is furious and screaming at Cesaro. Foley gets in between them and makes a best-of-seven series between the two of them starting at Summer Slam. The Dudley Boyz are already in the ring as New Day heads down for the next match. Before the match starts, Gallows and Anderson appear on the tron with another update in their research into “Ringpostitus.” Many testicle puns are made. Not a great match. It was very short, and it got pretty awkward once D-Von was tagged in. The teams just seemed a little out of sync. D-Von was supposed to go for a clothesline on Woods but hit Bubba instead, which he did, but the timing was strange. He also stumbled around the ring for no reason other than to let Woods tag Kofi. It was odd. Gallows and Anderson finish their comedy bit on the tron. Kofi and Woods get on the mic. They are a bit upset about Big E being hurt and question the tactics (and jokes) of their opponents. New Day assures them that Gallows and Anderson stand no chance of winning the tag titles at Summer Slam. Rollins is searching the hallways for the Demon King. He finds Neville instead. Neville tells Rollins that he isn’t ready to face the demon. Byron Saxton is in the ring with Rachel Levy as Nia Jax heads to the ring. Rachel says that she’s been watching the Olympics which has inspired her. Saxton still doesn’t like her chances in the next match. Squash, and not a great one. Jax’s finish looked sloppy. Brock Lensar and Paul Heyman head to the ring. As soon as Heyman opens his mouth to speak, Heath Slater interrupts and heads out to the stage. As the hottest free agent, Heath has come out to speak to Paul Heyman. He has been given an opportunity at a RAW contract if he beats Lesnar tonight, so he asks Paul for a match. An okay match. The outside shenanigans were as important as what was going on in the ring, and this was really just here to show that Owens and Jericho can work as a team. Tom Phillips asks Roman Reigns what we can expect tonight. Reigns is ready for anything and will beat up Rusev. Rusev attacks Reigns from behind, running him into a steel door and tossing him onto a catering table. An okay match. I don’t think anyone is surprised with how this went down. There wasn’t much in the way of in-ring action since it was short and we were just waiting to see how the Prim Time Players would turn on each other. They did it in the most expected way. Pretty good match. It was almost completely one-sided, but it was fun. Neville pulled off a couple of spectacular dives. Seth Rollins tells Stephanie McMahon and Mick Foley that he’s tired after searching for the Demon King. He thinks he should have the night off. Stephanie agrees, but Foley suggests that he calls out the Demon King from the ring. Rollins is in the ring and says there is nothing and no one that can stop him from becoming the first Universal Champ, even the Demon King. He’s searched everywhere for the Demon King but hasn’t found him, so he calls him to the ring one last time out of courtesy. No one comes out, so Rollins concludes that Balor is scared. As Rollins explains that he’s on another level and that Balor will bow down to him, the lights start to flicker and go out. Demon Balor heads to the ring. Rollins slowly gets face to face with Balor. The two brawl with Balor getting the upper hand. ** I liked the segment. I think this was more effective than last week’s stuff. I think it’s interesting that they’re not having Balor wrestle more to show what he can do. Saving it for Summer Slam is kind of cool though. Kind of a squash. It was just a match to show the dominance of Gallows and Anderson, something I think they should be focusing a little more on in this feud. After the match, Kingston and Woods attack Gallows and Anderson. Woods goes to hit Anderson in the groin with Francesca, but Gallows pulls him out of the way just in time. Dana Brooke apologizes to Charlotte for losing to Sasha last week. Charlotte makes a Devil Wears Prada reference, saying that Dana is Anne Hathaway (and an epic failure). An okay match. Fox had a little offense, but this was mostly Charlotte’s match. There wasn’t a lot to it, and the editing missed most of the finishing move. After the match, Charlotte motions for Sasha Banks to head to the ring. As Sasha enters, Dana Brooke runs in from behind and she and Charlotte double team her. Charlotte puts Sasha in the figure four/eight for a long time. Video package of Braun Strowman beating up small guys. Quite a good match. It seems like they gave away Summer Slam, but it also seems like Rusev might retain the title considering the ending of this one. They really put over the fact that Reigns will take an abnormal amount of punishment but still kick out, yet he just needs to hit one big move to take a victory. Even so, it was nice seeing Rusev counter and avoid so many of Reigns’ moves. He certainly didn’t get run over in this match. It’s a pretty good pairing with these two. This very much felt like the last show before a PPV. Most of the matches were extremely short and only there to propel a story into a bigger match. I like that Rusev is involved in one of the most important stories on the show, but I’m not sure if he and Reigns should take precedence over the Universal Title. If they want to build that as the top title, shouldn’t Rollins and Balor have ended the last RAW going into Summer Slam? A surprisingly good match, though I don’t know if they’ll be able to top it at Summer Slam.